Bunnik, the Netherlands, 8 November 2018 – BAM International (the operating company of Royal BAM Group active outside Europe) – together with JJM Construction (Canada) and Manson Construction (USA) – has received the full order to build the new Rio Tinto BC Works Terminal A on behalf of LNG Canada. The mobilisation and construction works being carried out by BAM and its partners for the Rio Tinto Terminal A expansion have started. BAM expects to complete this project in Autumn 2020. The project is valued at €95 million ($135 million CAD), with BAM’s share amounting to 50% and JJM and Manson covering the other 50%. BAM initially announced this contract in October 2017, ahead of final confirmation by LNG Canada. LNG Canada has agreed to extend the existing BC Works Terminal A in exchange for their Terminal B, which handles exports of finished products for Rio Tinto’s ongoing operations. The location of Terminal B coincides with LNG Canada‘s Liquified Natural Gas (LNG) export terminal in Kitimat, British Columbia (approximately 600 km north-west of Vancouver). LNG Canada represents the largest private investment in Canadian history and showcases how industrial development can co-exist with environmental stewardship. 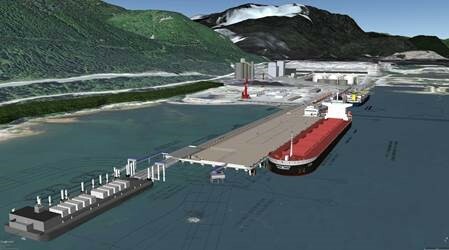 The project will consist of a 320 x 60 metre terminal for the Rio Tinto BC Works, as well as a berth for cargo barges. Both elements will be built on more than 400 steel piles with a concrete deck of approximately 20,000 m3. LNG Canada is a joint venture company comprised of five global energy companies with substantial experience in LNG: Shell, Petronas, PetroChina, KOGAS and Mitsubishi Corporation. The joint venture will be responsible designing, building and operating the LNG Canada export terminal. The first phase of construction will take approximately five years. Since 2011, LNG Canada has worked closely with Rio Tinto, the community, First Nations, and municipal and regional governments to understand how the project can help Kitimat, the region and the wider province of British Columbia to achieve its social, economic and environmental aspirations.